What happens when you book a flight ticket, besides taking that particular flight? Most of the times we are eligible for accruing frequent flyer miles. Most of the time we let it go, thinking we do not fly much. Even as a travel blogger I became aware of the power of accruing miles late in my blogging life. But believe me every little bit counts and if you have not investigated frequent flyer programs till now, it is time. And you have the perfect opportunity, as Jet Airways is celebrating #TheBillionMilesFestival now. Jet Airways’ #TheBillionMilesFestival is for both existing JetPrivilege (JP) members and ones who wish to enroll for the program. If you are already a JP member you are probably aware of the festival and the benefits of it. #TheBillionMilesFestival is the biggest opportunity ever to earn a million JP miles. If you are planning to book a ticket anytime up to March 31, 2017 consider booking it on Jet Airways’ website jetairways.com or on their mobile app and enroll for the JetPrivilege membership. You can fly up to 31st May, only the tickets need to be done by 31 March to avail the offer. You earn flight miles every time you fly, but you also receive bonus 250 JPMiles when you book on jetairways.com or the mobile app. 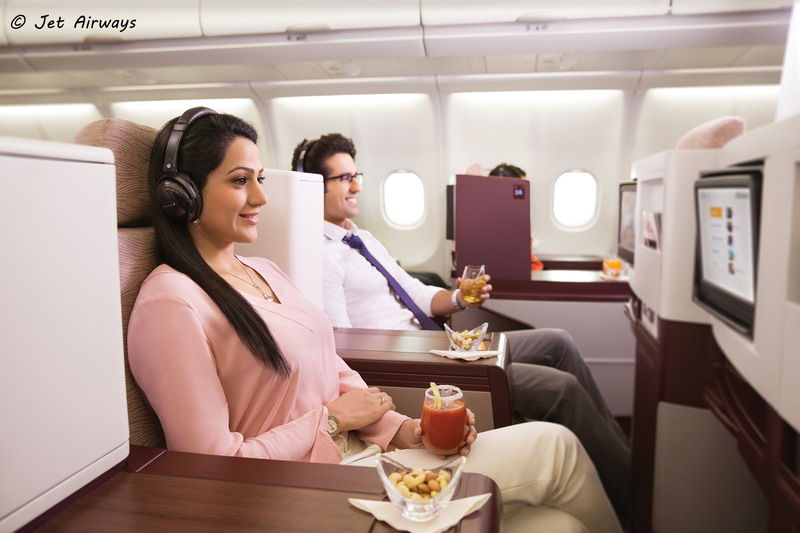 But with #TheBillionMilesFestival, you get additional 10,000 Bonus JPMiles per segment when you fly in First Class, 5,000 Bonus JPMiles when you fly in Première and 1,500 Bonus JPMiles per segment when you fly in Economy. These are guaranteed when you book direct on the Jet Airways website or through the Jet Airways mobile app. Other than the guaranteed returns there are bumper prizes to be won every day by a few lucky people. 40 lucky winners, stand a chance to win 100,000 miles each during the offer period. Jet Airways will select one winner every day.There is one grand prize of One Million Miles for one lucky winner. The mind boggles at the thought of one million miles! If you wish to play around and plan your journey with one million miles try their JP Miles calculator. To fly between say Delhi and Abu Dhabi round trip I would need 35,000 JPMiles. There would still be 965,000 miles left to spend! The mind once again boggles at the thought! However, do note that you still need to pay the relevant taxes when you buy a ticket with miles but this would be true of any frequent flyer program. You can fly to any of Jet Airways’ 66 destinations (46 within India and 20 international) plus explore 1000+ destinations with their 25+ partner airlines. . So, if you are planning to buy a ticket and fly any time before March 31, 2017 consider booking it direct with Jet Airways website or mobile app and enroll for JetPrivilege. Who knows you could be one of the lucky winners! Tip: If you find an interesting fare on the Jet Airways website and are not sure about your travel plan, you can block your preferred fare for a very nominal amount and pay any time within the next 72 hours. Psstt.. Saves you from price hikes if any. hi, we’re a couple in as much love with mountains as with each other. It was our Himalayan destination Sikkim this time. Many congratulations to Neha. 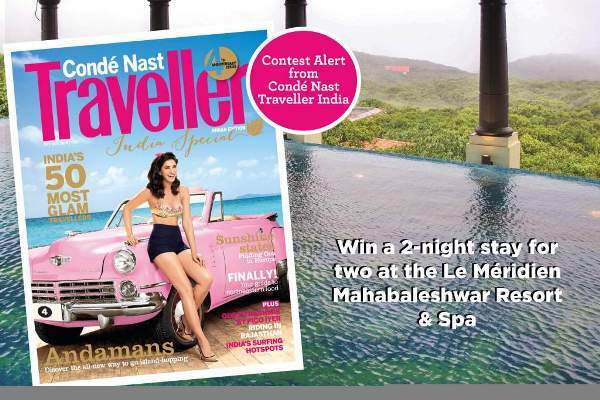 A member of Condé Nast Traveller India team will get in touch with you. Do remember that the winning entry was picked by the CNI team alone. I had no role in judging the contest. Thank you all for taking part and sharing so many wonderful tips. I hope you will have a fabulous stay with Le Méridien Mahabaleshwar Resort & Spa Neha. All you have to do is share your best-kept travel secret in less than 100 words with Travel Tales from India using the hashtag #TravelSecret. Don’t forget to include your email address. So the last line of your comment should look like #TravelSecret followed by your email. The contest ends on 24 November 2014. Share Your Thoughts to Win! Share your thoughts in the comments section, from which the name of one lucky winner will be chosen. The best entry as judged by the CNI team would win. The hotel opens to public from March therefore the validity for winning voucher is from 1st March to 31st Oct 2015. All the coordination for the winner would be done by CNI team. I am sure you wish to know more about the resort and this is what an exclusive preview in Condé Nast Traveller India October – November 2014 issue says about the property. “If you’re looking for a holiday full of delicious contradictions—seclusion and togetherness, modern luxury and mossy wooded groves—this is a good hotel to pick. Its romance and tranquility is undeniable and it affords an unexpected degree of privacy. Several rooms are housed in stand-alone buildings separated by acres of wooded area, so you can allow yourself the illusion of having the place to yourself. The suites, several with terraces, and bearing names such as Serenity and Sanctuary, offer sweeping views of the evergreens clothing the hills. Jamun trees nestle against the walls of the terraces. There’s food for the soul, too. This being berry country, you can expect strawberry pancakes and mulberry shots, apart from intriguing signature dishes such as the Gavran mooli chathai peeth and chikki muffin. Look out for Latest Recipe, which serves international cuisine. And for coffee and cocktails, there’s Longitude 73. Outside, there are additional delights, such as pony rides or fruit cream from roadside eateries. You could walk up to one of those ‘points’ where you can sit and contemplate. Or you can hold hands and rediscover good, old-fashioned romance in this good, old-fashioned hill station.